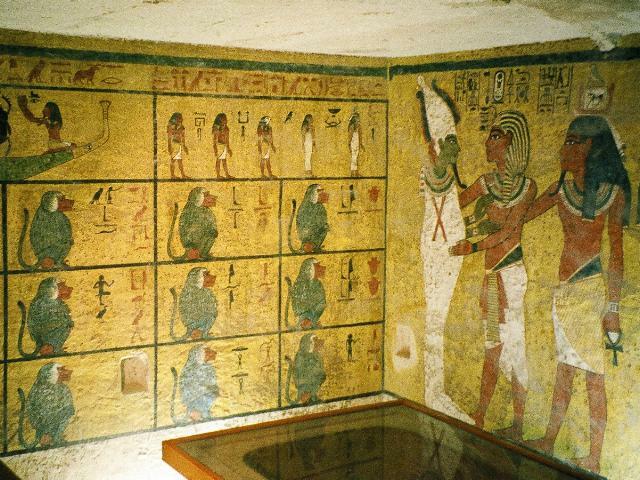 King Tut’s tomb (known as KV62) was discovered in the Valley of the Kings in 1922. His coffin, made of solid gold, weighs 450 pounds. Tut’s treasures, on display at the Egyptian Museum in Cairo - a city where massive non-violent, anti-government protests (resulting in the resignation of Hosni Mubarak) erupted in 2011 - represent some of the few royal artifacts not stolen by grave robbers soon after pharaohs were buried. The expedition which led to this awesome discovery was funded by a Brit named George Herbert. His official title (after the death of his father) was the 5th Earl of Carnarvon. Inheriting his ancestral home - Highclere Castle - the 5th Earl had great prestige but not much cash. When he married Almina Wombwell - the goddaughter of Alfred de Rothschild, a very wealthy banker - the money problems of George Edward Stanhope Molyneux Herbert were over. By signing an agreement to mary the girl who may actually have been Rothschild's daughter, the 5th Earl had access to an annual sum of £6.5 million (in today's currency). That converts to a bit more than $10 million every year. Even with income like that, however, it took a great deal of money to fund Howard Carter's Egyptian excavations. Only when Carter said he'd pay-for one more year of effort himself - which he could not afford to do - did Lord Carnarvon agree to continue as benefactor. The Carnarvons, parenthetically, are the real-life models for Robert Crawley (the 7th Earl of Grantham) and Cora Crawley (Countess of Grantham) who live at Downton Abbey (the real-life Highclere Castle). And ... just like the fictional Granthams ... the real-life Carnarvons opened their home to injured World War I soldiers. At last have made wonderful discovery in the Valley. A magnificent tomb with seals intact. Re-covered same for your arrival. Congratulations. Funerary chapel housing Tut's sarcophagus. Howard Carter cleans the third coffin of King Tut. Side view of the death mask. Back view of the death mask. The mummy of King Tut, after the wrappings were removed. An artifact from Tut’s tomb. Tut’s throne depicts the king and his wife. Alabaster jars contained Tut’s internal organs. Statues of 365 servants accompanied the pharaoh to his tomb so they could serve him 365 days a year. One of King Tut’s guards. King Tut and Ankhesenamun, His Wife. Recent testing, of King Tut's remains, have revealed some interesting findings. The "Boy King" likely suffered from a bout of malaria, may have had a rare bone disorder and probably sustained a fall which fractured his leg. There may be other treasures, still intact with the mummified remains of pharaohs who owned them in life, resting undisturbed in the Valley of the Kings. But given mankind’s endless fascination with mummies, it is safe to say we have not heard the last of the great discoveries. Bos, Carole "KING TUT (AND DOWNTON ABBEY)" AwesomeStories.com. Sep 01, 2006. Apr 24, 2019.